STEAM-y Storytime 2: Under the Sea, Matey! Wow! STEAM-y Storytime 2 was part fabulous, part controlled chaos. With almost 70 kids and caregivers, we managed to read, sing, experiment, and create! A storytime friend returned to the library to read this week. I provided him with a few pirate and sea books that he brought to life between songs on his guitar. 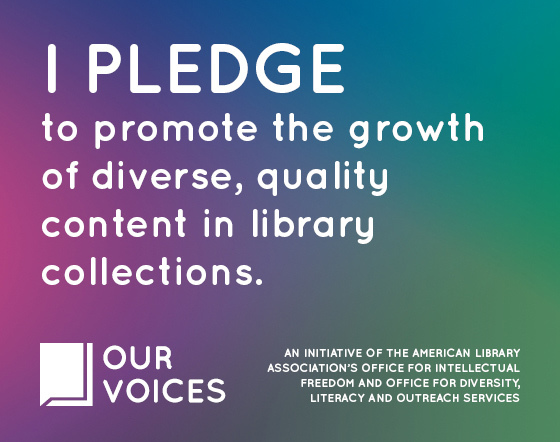 This volunteer is a great addition and I love introducing storytellers to the library families. Lots of rhyming in this week’s books! All were kid-pleasers. 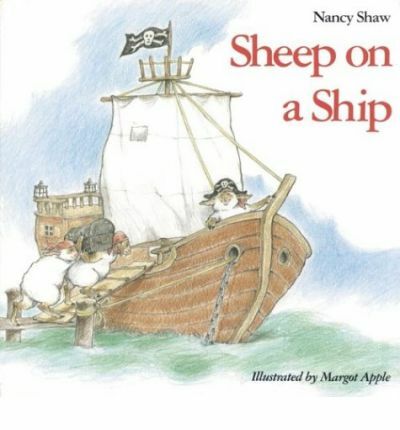 Sheep on a Ship by Nancy Shaw and Margot Apple (Houghton Mifflin, 1989). 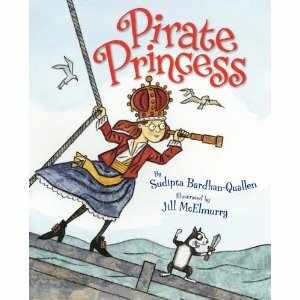 Pirate Princess by Sudipta Bardhan-Quallen and Jill McElmurry (Harper Collins, 2012). 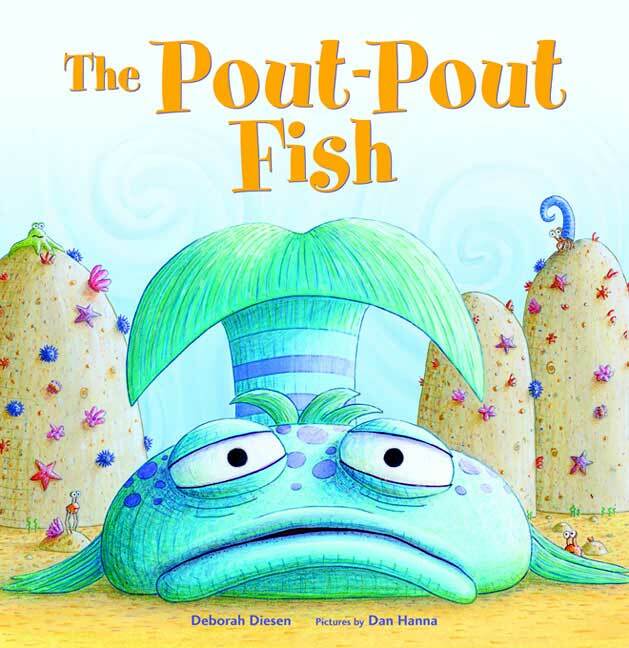 The Pout-Pout Fish by Deborah Diesen and Dan Hanna (Farrar Straus Giroux, 2008). 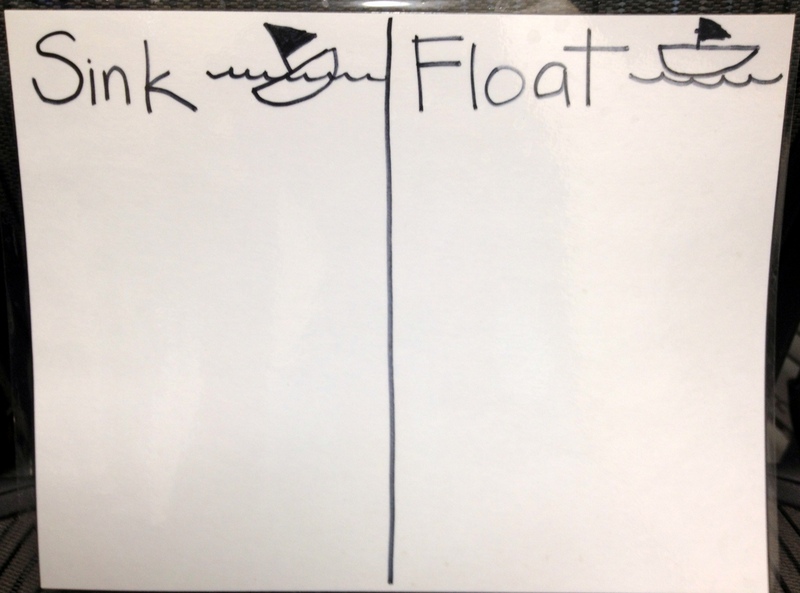 Sink and Float is a classic preschool activity, but it was a first for storytime at our library, perhaps because of the water that ended up all around the station! Clean was pretty easy though, thanks to plastic table covers. I had four tubs of water with a variety of objects and a laminated sink-float chart alongside. Caregivers were instructed to help kids predict if each object would sink or float and why. They placed the object on the chart under sink or float based on their decision. Then they tested their prediction. 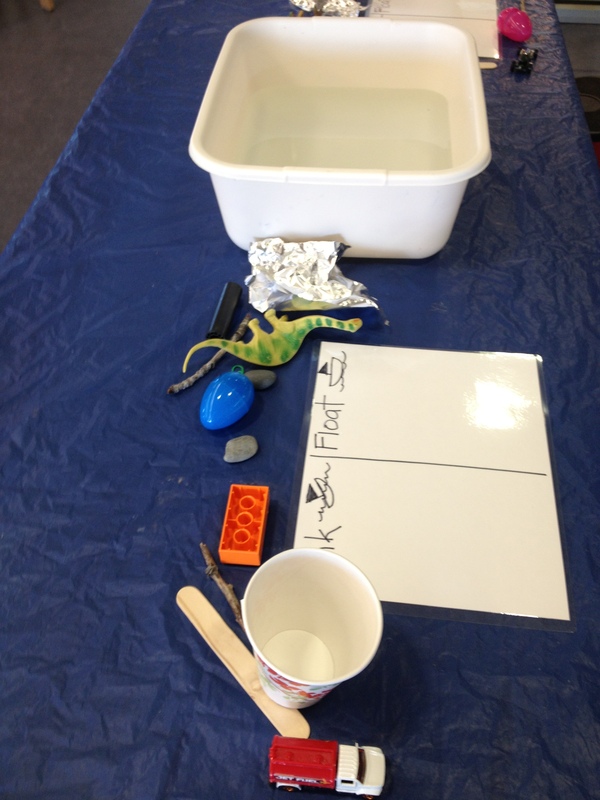 The best moment at this station was watching a little one’s face when we made an aluminum foil boat that floats and placed an object that sunk on top of it…and it floated. His mind was blown! This station was a hit! It allowed kids to do what they do best: create and explore across media. 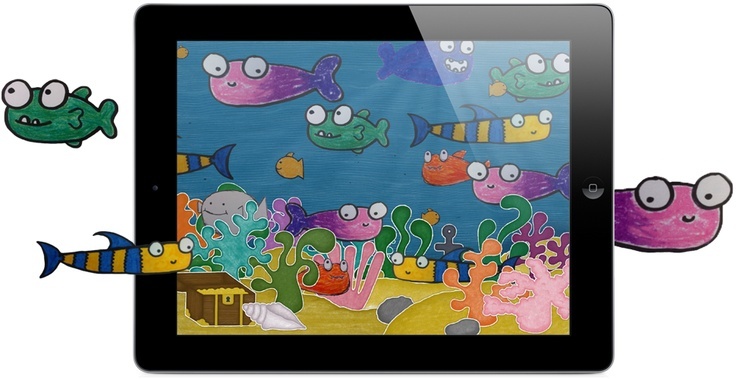 Using fish drawn on 1/4 page white cardstock and the Squiggle Fish app on an iPad, we turned over twenty-five fish into a digital sea swimming with creatures! The trick with this app is having kids draw and color fish on the white paper and outline the fish with a thick black pen. I had kids write their names inside the black outline so we could easily identify the fish on-screen. Once the fish were finished, I held the iPad over the drawings and the picture of the fish, minus the white background, was digitized and animated on screen. We had everything from a family of fish to an octopus. While the finished sea of creatures isn’t shareable (maybe in an update? ), I took screenshots of different views of our sea and posted one on our library’s Facebook page for families to download. Are you looking for other apps to integrate into storytime? Check out the field-tested apps for toddlers, preschoolers, and elementary age kids pinned on Little eLit’s Pinterest boards. Each pin includes technical information and suggested storytime use. At the last minute I added this simple craft station, fortunately. This one was most popular with younger kids and allowed almost every kid to find something that captured their interest. I found the idea on Pinterest. The minimal materials made it affordable and easy to put together. A sheet of cardstock folded on each of the short edges and down the middle was cut horizontally (to the side folds). 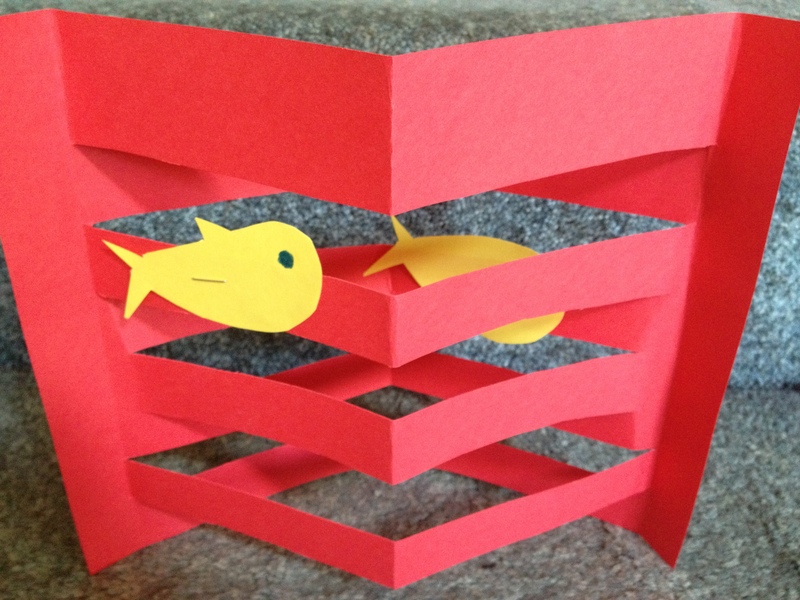 Small fish were cut out of 1/8 page scrap construction paper and stapled on to the slats. I had several fish already cut out as samples, but kids and caregivers cut out many more. Some paper was cut in wavy lines making the scene look even more sea-like. This craft was perfect because it was self-explanatory and the teen volunteer and I could focus on the other two stations.